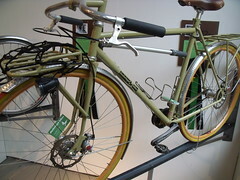 Integrated racks, swept-back bars, discs, lights, leather saddle, honjo fenders, muted paint – all the urban-bike prerequisites are checked off with this Donkelope bike, except for that pump. Custom builders usually paint pumps to match frames or expect the owner to attach a mini-pump to the bottle cage mounts that’ll require 300 forearm-straining strokes to get 72 PSI. Having used a Biologic Zorin Postpump with our Dahons during our Mobile Social Worldwide, I wish they’d license that technology and I could have a seat pump on my rain and touring bikes. There’s no consumer truth-in-pumping requirement and minipumps manufactures will promise you pumping power. They’re lying. A pump no bigger than a lipstick case will NOT inflate your road tire. Minipumps do not pump well. In the Northwest, most cyclists I ride with have given up on minipumps and carry Co2. Uploaded by gregraisman | more from the Bike Hugger Photostream. Previous Previous post: Cycle University West Seattle Grand Opening Party!